The VARIOspeed VFD is able to automatically control the pump speed and maintain a constant discharge pressure as the flow and head conditions change in the pumping system, and the desired set pressure is set using the user friendly VFD keypad. The pressure transducer measures the pump discharge pressure. 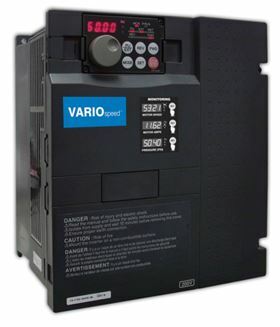 The VARIOspeed VFD is available from 5HP to 150HP at 208-240V and 5HP to 250HP at 380-480V, single phase or three phase supply voltage. It features PID control, energy optimization control, adjustable electronic overload, automatic system restart, high and low pressure alarms. The standard VARIOspeed VFD is supplied in a NEMA 3R enclosure with a 0-200 PSI pressure transducer. It can be customized to suit specific requirements, including duplex, triplex and quadplex VFD systems with automatic alternation and lead/lag operation. The VFD is suitable for applications including booster pumps, deep well submersible pumps and irrigation pumps.